Preface: Corey here, letting you know this is a guest post from Lacey Baxter (shown in the pics below from 2008 and 2014). Lacey cheered for me at KU and has been a healthy eating specialist ever since. Who better to write it? Enjoy! Cheerleaders are in a category of athletes that need to pay extra attention to our diet. I had to learn early on that looking like you’re in good shape doesn’t necessarily mean you’re a healthy athlete, and your performance may be suffering without you even realizing it. Here are five quick tips for optimal performance and recovery. Every body is unique and there isn’t a one-size-fits-all eating plan. Listen to your body and provide it with the quality nutrient-rich foods it deserves. Plants are the only foods that contain phytonutrients, which provide health benefits and allow optimal performance. Whole food sources in a variety of colors are the best ways to get phytonutrients, because foods in their whole (aka raw or unprocessed form) provide the synergy for optimal nutrient absorption. Each color of fruit or vegetable contains different combinations of these phytonutrients, and they work better together than separately. My favorite colors to eat include kale, beets, broccoli, carrots, strawberries, and watermelon! Eat Greens First! I start my day with a big green drink in the morning, and I have a side salad topped with a variety of colorful veggies before most meals. Enough said. Our bodies are roughly 60% water so give it what it wants. If you experience thirst, you are already dehydrated. It’s important to drink water all day long to prevent dehydration. Opt for water over any other drink. Water helps with circulation of nutrients and when we’re dehydrated, things just don’t work as well. Strive for half your body weight in ounces of water per day. For example, if you weigh 120lbs, you should drink 60oz of water each day. Eating raw fruits and vegetables is a good way to increase your water intake as they are filled with water. 4. Focus on quality whole foods as fuel. As cheerleaders, we put our bodies through a lot and burn through calories quickly, so we need to nourish our bodies with quality fuel, not processed or fast foods. Be wary of packaged “nutritional products” like many common brands of bars and drinks. They are often chemical-laden, processed and unnatural products. They may give you momentary energy but they’re lacking in nutrients, which could harm your body in the long run. Protein, carbs and fats aren’t the only important nutrients to focus on when choosing pre and post workout foods. Try to find foods with the most phytonutrients, vitamins and minerals too. For example, choose a quinoa salad with bell pepper, avocado, nuts and seeds, instead of a bagel and peanut butter. The salad contains a good amount of macro and micro-nutrients (protein, carbs, fats, phytonutrients, minerals, vitamins), whereas the bagel will provide quick energy, but lacks in the amount of nutrients. Cheerleaders have no business restricting their calories if you’re filling yourself up with wholesome and quality foods. Follow my above guidelines and you should feel satisfied and replenished. When athletes cut foods out of their diet it can be extremely hard on the body. It only makes sense that if our muscles are in need of repair after a workout, the quality and quantity of food matters. If you have food sensitivities, be aware that you should replace with an adequate amount of quality foods. For example, if you are gluten free it doesn’t mean you should necessarily cut all grains out of your diet. There are many delicious gluten-free grains that can provide essential nutrients. It’s important to remember that cheerleading is an intense sport that requires the same amount of attention to nutrition as any other sport. Providing your body with the energy, stamina and mental focus is extremely important considering the crazy demands that cheer puts on our body. 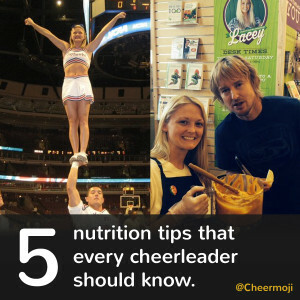 Establishing the habit of consuming a diet of nutrient-rich and whole (non-processed) foods will set you well on your way to cheerleading success! * As a Health/Wellness coach I do not intend to diagnose, treat, prevent or cure any disease or condition. It is not intended to substitute for the advice, treatment and/or diagnosis of a qualified licensed professional. Trained Health Coaches may not make any medical diagnoses, claims and/or substitute for your personal physician’s care. As your health/wellness coach I do not provide a second opinion or in any way attempt to alter the treatment plans or therapeutic goals/recommendations of your personal physician. It is my role to partner with you to provide ongoing support and accountability as you create an action plan to meet and maintain your health goals.